Add the olive oil to a large pot and parboil the onion and garlic. Add the chicken and combine. Then add the canned tomatoes, chopped piquillo peppers, chipotle, chicken bouillon cubes, cumin and pepper. Stir well with a wooden spoon and add the bay leaves and beer. Cover the pot and let it cook over medium heat. Taste the stew and add salt to taste, if necessary. The longer you cook the stew, the better the flavor. Lastly, add the nopalitos, cover the pot again and cook for another few minutes. You can serve it with black beans and white rice. This recipe is great if you’re going to use cooked chicken from the day before. Adriana Martin / Adriana’s Best Recipes French fricassee was made with white sauce and chicken, but this dish has evolved and changed. The fricassee we Latinos are familiar with is a stew usually made with tomato sauce, olives, potatoes, meat and vegetables. The first time I tried fricassee was at the table of a Cuban family, and ever since, I’ve continued enjoying it and added my personal touch to it. 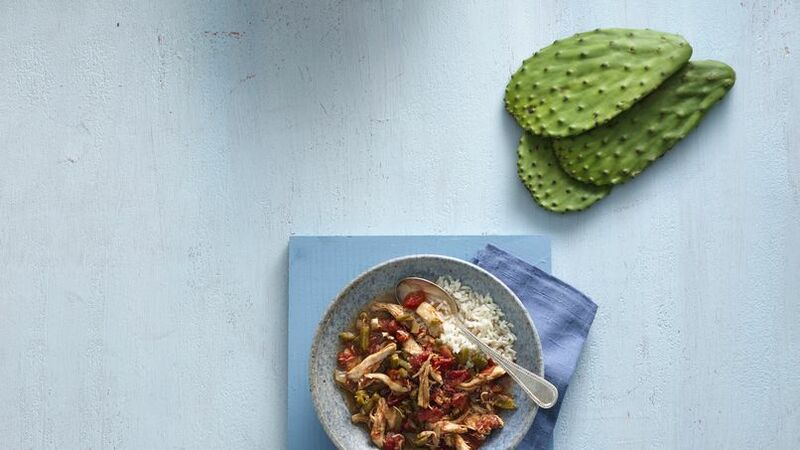 As we celebrate Hispanic heritage, I’d like to pay tribute to Cuba, where my husband is from, with this delicious Mexican chicken fricassee recipe.